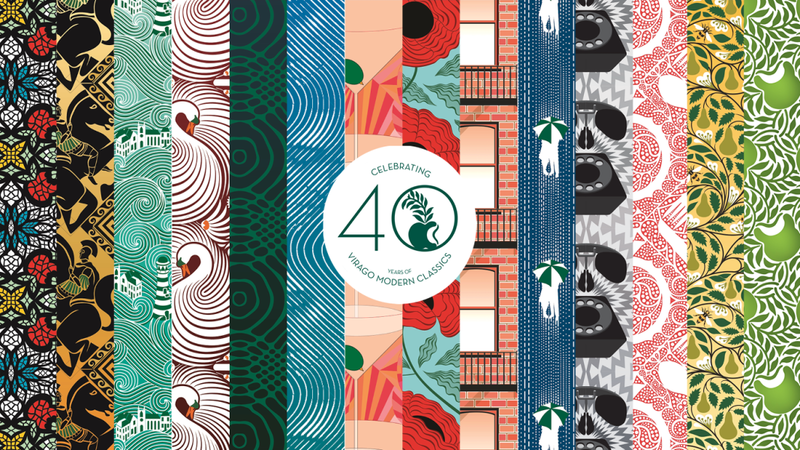 This May we are publishing a spectacular collection of Virago Modern Classics, in celebration of our 40th anniversary. The entire collection, plus a hardback anthology, Writers As Readers, features artwork by the incredible illustrator, Yehrin Tong. One night Melanie walks through the garden in her mother’s wedding dress. The next morning she learns of her parents’ deaths and her world is shattered. She is sent to live with relatives she has never met: gentle Aunt Margaret, mute since her wedding day; and her brothers, Francie and Finn. Brooding over all is Uncle Philip, a toymaker who loves only his creations: clockwork roses and puppets that are life-size – and uncannily life-like. Sally Jay Gorce is a woman on a mission. It’s the 1950s, she’s American, twenty-one and in Paris. Witty, headstrong and disaster-prone, she dyes her hair pink and prowls the Left Bank in search of love, adventure and fame. Will our heroine be forced back to the States to fulfill her destiny as a librarian, or can she keep up her whirlwind Parisian existence? Seven months into her pregnancy, Rachel discovers that her husband is in love with another woman. The fact that the woman has a ‘neck as long as an arm and a nose as long as a thumb’ is no consolation.Sometimes food is, though, and between trying to win Mark back and wishing him dead, Rachel offers us some of her favourite recipes. Heartburn is a roller coaster of love, betrayal, loss and – most satisfyingly – revenge. This is Nora Ephron’s roman a clef: ‘I always thought during the pain of the marriage that one day it would make a funny book,’ she once said. And it is! Istina Mavet descends through increasingly desolate wards to Lawn Lodge, where patients are considered beyond hope and a leucotomy theonly method of rehabilitation. As she observes her fellow patients, long disregarded by hospital staff, with humour and compassion, she reveals an original and questing mind. When Janet Frame’s doctor suggested that she write about her traumatic experiences in mental institutions in order to free herself from them, the result was Faces in the Water, a powerful and poignant novel. Melinda Van Allen is beautiful, headstrong and alluring. Unfortunately for Vic Van Allen, she is his wife. Although there is no love in their marriage there is jealousy and Melinda takes pleasure in flaunting her many affairs. When one of her lovers is murdered, Vic hints to her latest conquest that he was responsible. As rumours spread about Vic’s vicious streak, fiction and reality start to converge. It’s only a matter of time before Vic really does have blood on his hands. When Janie, at sixteen, is caught kissing shiftless Johnny Taylor, her grandmother swiftly marries her off to an old man with sixty acres. Janie endures two stifling marriages before meeting the man of her dreams, who offers not diamonds, but a packet of flowering seeds . . .
A chance encounter with the man who enchanted her as a teenager leads Olivia Curtis into to a forbidden love affair. Rollo Spencer is now married, and Olivia’s life changes to one of secret meetings, brief phone calls and snatched liaisons in anonymous hotel rooms. Years ahead of its time when first published in 1936, this subtle and powerful novel shocked it readers with its searing honesty and passionate portrayal of clandestine love. Here are all Grace Paley’s classic stories in one volume. Paley’s quirky, boisterous characters and rich use of language won her readers’ hearts and secured her place as one of America’s most accomplished short-story writers. Her stories are united by her signature interweaving of personal and political truths, her extraordinary capacity for empathy and her pointed depiction of the small and large events that make up daily life. Alexander the Great died at the age of thirty-three, leaving behind an empire that stretched from greece to India. Fire From Heaven tells the story of the years that shaped him. His mother, Olympias, and his father, King Philip of Macedon, fought each other for their son’s loyalty, teaching Alexander politics and vengeance. His love for the youth Hephaistion taught him trust, while Aristotle’s tutoring provoked his mind and fuelled his aspirations. Killing his first man in battle at the age of twelve and commanding Macedon’s cavalry at eighteen, by the time his father is murdered, Alexander’s skills have grown to match his fiery ambition. Dame Lettie Colston is the first of her circle to receive insinuating anonymous phone calls. Neither she, nor her friends, wish to be reminded of their mortality, and their geriatric feathers are thoroughly ruffled. As the caller’s activities become more widespread, old secrets are dusted off, exposing post and present duplicities, self-deception and blackmail. Nobody is above suspicion. In the faded coastal village of Newby, everyone looks out for – and in on – each other. Tory is having an affair with Robert, while his wife, Beth, is consumed by the worlds she creates in her novels, oblivious to the relationship developing next door. Their daughter Prudence is appalled by the treachery she observes. And Mrs Bracey, whose grasp on life is slipping, peers from her window, prodding her daughters for news of the outside world. Into their lives steps Bertram, a retired naval officer with the unfortunate capacity to inflict lasting damage while trying to do good. 2018 marks the centenary of the end of the First World War. It is also one hundred years since the first publication of Rebecca West’s powerfully moving novel. The soldier returns from the front to the three women who love him. His wife Kitty, with her cold, beauty, and his devoted cousin Jenny wait in their exquisite home. But the soldier is shell-shocked and can only remember Margaret who he loved fifteen years before, when he was a young man and she an inn-keeper’s daughter. The women have a choice – to leave him in the past,where he wishes to be, or to ‘cure’ him. It is Margaret who reveals a love so great that she can make the final sacrifice. Nanda Gray, the daughter of a Catholic convert, is nine when she is sent to the Convent of Five Wounds. Quick-witted, resilient and eager to please, she accepts this closed world where, with all the enthusiasm of the outsider, her desires and passions become only those the school permits. Her only deviation from total obedience is the passionate friendships she makes. Convent life is perfectly captured – the smell of beeswax and incense; the petty cruelties of the nuns; the eccentricities of Nanda’s school friends. In this beautiful hardback anthology, forty of the most significant writers of the past century tell us about one of their favourite writers by introducing books from the Virago Modern Classics collection, offering a glimpse at the treasures that have been published over the past four decades: they may be great works of literature; they may be wonderful period pieces; they may reveal particular aspects of women’s lives; they may be classics of comedy, storytelling, diary-writing or autobiography. Writers as Readers is a thought-provoking collection that is a joy to read.